Accommodates up to 6 people fully self-contained. Pillows and blankets are provided. You will need to provide your own bed linen and towels. 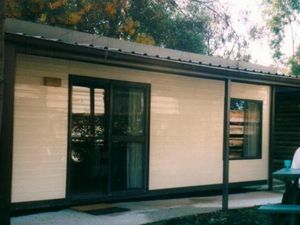 Happy Wanderer Holiday Resort is centrally located on the Western side of the Grampians National Park at Wartook, approximately 30 minutes from Halls Gap and Horsham. Cabin Van accommodation provides budget accommodation for families or small groups. External private ensuite bathroom. Suitable for 2 adults and 4 children ( or 4 adults and 2 children). Double bed at one end, kitchen/dining in the centre and two sets of bunks at other end. All bed rooms have curtains to pull across. Kitchen has full small stove/grill. Blankets and pillows provided. T.V. provided. BYO linen and towels. Two cabin vans to select from as well as other types of park accommodation.